The challenge to an artist to think about his or her influences is such a central one that it immediately sends a stream of thoughts about a seemingly endless number of artists through one’s head. 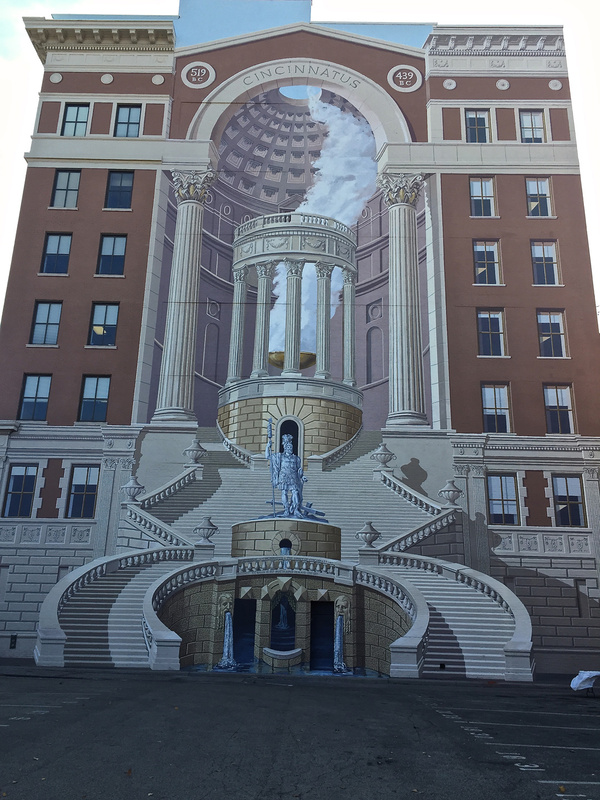 There have been countless artists, art works, and whole periods of art and architectural history that have passed before my eyes. Whenever I am asked by someone, “What is your favorite work of art or artist or what is your own favorite project?” I generally freeze up for a moment and try to beg off the question as best I can. One is prone to rising and receding enthusiasms for art heroes. They really mount up over more than 5 decades of serious looking. My own art journey began in the mid 50s with my excitement about Frank Lloyd Wright, which was fed by my circumstances of birth, family connections and a growing architectural interest in general, combined with an early love of Cezanne, who influenced my first paintings. Along with this, I could add a serious study of Rembrandt etchings as I became more active in printmaking. As artists, we do not necessarily drop any of our early enthusiasms as we evolve but simply pile more and more influences into our art tool chest. My interest in architecture stemmed from where I was born, two miles north of Taliesin East. I had family members who knew and worked for Wright. Architecture wove itself in and out of my art and eventually became my dominant interest over most of my career. As I plugged myself into Taliesin and the world of its master, I also explored the greater urban environment of the Midwest, which included not only Madison and Milwaukee, but especially Chicago. That city was the mother lode of much of my growth with all of its precedent-setting architecture and its great museum, The Chicago Art Institute. That museum more than any other was where my journey into art history began. As I travelled more, and especially after I moved to New York in the late 60s, my study and knowledge of art history grew tremendously. I was also fortunate to receive an extensive art historical education, taking over 30 credits in the field while working on my MFA at the University of Minnesota. Besides London and Paris, my trips also included Amsterdam and the Low Countries, Munich and especially Italy. In Florence, Rome and Venice I extended my interest in Giotto, Piero, Fra Angelico, the Bellinis, Mantegna and of course Michelangelo. I made repeated visits to The Arena Chapel in Padua and Mantegna’s Camera del Sposi in Mantua. Mantegna’s completion of that room which welded the ceiling and walls together seamlessly was, in its daring simplicity, an unprecedented masterpiece. There were countless other works of a similar nature that I studied including the Rococo churches of the Asam and the Zimmerman Brothers in Bavaria, sites I revisited on many occasions. 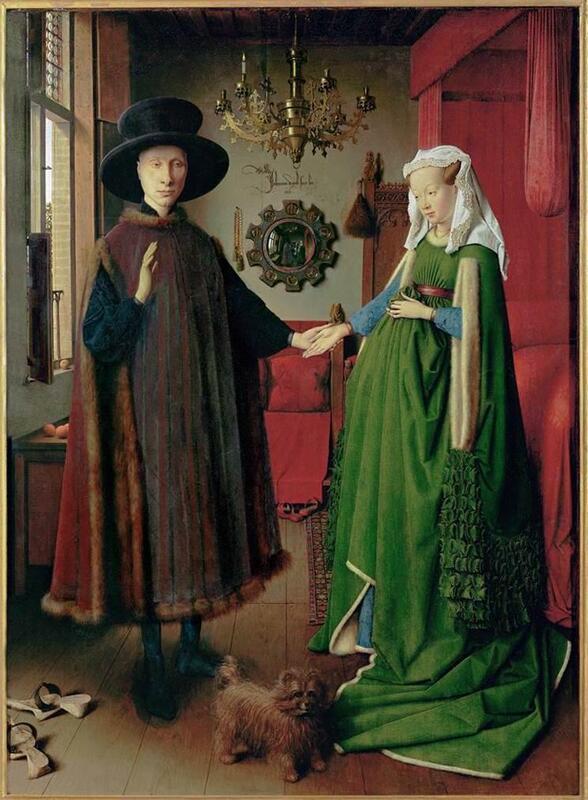 It is a little surprising to me, as it also may be to others, that I have decided to land on Jan van Eyck and The Arnolfini Wedding as the single most important work for me to focus on. Why Van Eyck and this particular painting? There are many reasons. It may be that the refined clarity and particularity combined with an amazing hollowing out of pictorial space was achieved best by the Flemish artists, especially the one who for me was their greatest master. It may also be that the strain of my Germanic heritage causes me to identify with this artist in particular. It seems to me that few other works capture space like that room Van Eyck created with all of its soft light, its spare but elegant furnishings, and of course the bridal pair, with their lavish attire and attractive, if peculiar, attitudes. When I say that this work set a precedent, I do not mean that there were not plenty of interesting paintings of such interiors before, as I know there were, but for me none pulled the viewer in like this work and none up till then managed to control our sense of the space. It also seems to have spun off a host of imitations and variations that followed for centuries. I cannot help but think of Valasquez’s Las Meninas with his brilliant trick of using the reflective mirror in the center, like Van Eyck did, nor can I help but think of a host of Vermeer paintings (another favorite artist). The reflective round mirror of Van Eyck’s painting acts as a visual center but also as a way of seeing out and beyond our cone of vision to feed our imagination while extending our sense of location. We see that others are now entering the room. The window on the left functions as a way of taking us out and beyond the room itself and adds to the subtle logic of how the space is lit, even though the light is fed by multiple sources. Then there are the objects that reflect that light so beautifully, like the candelabra above and the oranges on the table below the window with one orange on the windowsill. We are told that oranges were not only rare but also symbols of love and marriage. There are many other symbols that relate not only to fertility and pregnancy but also to the presumed wealth of the subjects, such as: the wooden slippers so casually but carefully placed, the bed, and even the seemingly frozen dog, which we are told is a Brussels Griffen, known to be a special terrier bred to catch rats. I know that all of this symbolism has been dealt with ad infinitum by historians over the centuries and that they have analyzed the couple ad infinitum as well. Was she pregnant? Was this a version of a shotgun marriage from that period? The headboard contains a carved statue of St. Margaret who was the patron of childbirth to bring home the issue of pregnancy. What was the exact status of the couple, since we know they were rather high in the aristocratic order? The clothes alone, with their rich materials and expensive dyed colors, indicate their higher status. Research seems to confirm that they were actually of Italian merchant origins from the area of Lucca. We see in the commission how wedded the wealthy areas of Europe were to each other, as Bruges and Tuscany were both among the richest areas at that time. It also shows how the painters of Flanders and those of Renaissance Italy were very connected. It was during my own early rambles through historic art, including not only the Flemish but also the Dutch artists, especially Vermeer, that I began to make study drawings. I also decided to start a series of miniature interiors in three-dimensional dioramic boxes depicting Dutch and Flemish interior paintings. One of the first that I dwelled on was The Arnolfini Wedding where I spent countless hours constructing the imaginary space of that room with all of its details and also constructing silhouettes of the figures. I then proceeded to carefully light the box in an attempt to reproduce the ambience of that room. I felt it was moderately successful and I went on to make several other boxes of a similar nature. These included a dioramic box of Vermeer’s The Art of Painting in the Kunsthistorisches Museum in Vienna and many more of recent artists as well. Matisse in Nice, Picasso in his Paris studio, Gertrude Stein in her dining room along with Pollock in his Springs studio were but a few of these works. There were many things driving me during this rather obsessive period of work. I wasn’t trying to get closer to a particular time and space, but somehow to get closer to how the artist thought and felt while making the work. I doubt that I succeeded in my explorations, especially in regard to Van Eyck and Vermeer, but I have little doubt that these explorations fed my desire to attack real space in a more meaningful way. They certainly heightened my focus on contemporary urban spaces and interiors, where I hoped to inject my own sense of illusion and heightened reality. I think I did manage to carry that off in ways that I never would have imagined in the early period of my study and work. My gazing for extended periods at The Arnolfini Wedding in the National Gallery of London and then walking into another room and peeking into Van Hoogstraaten’s painted interior box set me off on a very long, complex journey that I hope is not yet over.